Everyone is always asking me about my hair. It is really long, so it always attracts a lot of comments and questions. The questions are always: "How long did it take to grow that long?" "When was the last time you cut it?" and, of course, "What products do you use?" This post is meant to answer all the questions, as well as I can. 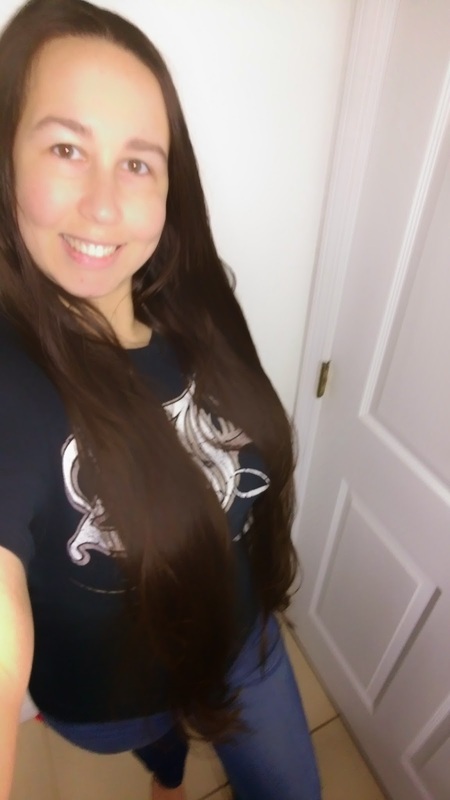 I have had my hair long for many years, but I cut 6-8 inches of dead ends off pretty regularly, so I can't really way with any certainty how long it took to get to this length. The last time I cut it was sometimes last year. As for what products I use, it really is not as simple as just specific products, so I decided to list my top 5 "Hair Hacks". 1. Wash hair as little as possible. This is going to sound weird to a lot of people, and maybe will even sound gross, but I wash my hair only when it needs it, which is not that often. Washing too often strips natural oils that would otherwise promote smooth, shiny, healthy hair. Also, many shampoos have harsh ingredients that are even more damaging to hair. If my hair starts getting oily at the roots, then I was it, otherwise, I just wear a shower cap. 2. Rinse hair in cold water. It is a good thing I don't wash my hair every time I shower, because another trick I use is to rinse my hair only with cold water. I despise cold showers. I like the water as hot as I can stand it. Warm/hot water is good for opening the hair cuticle, so at the beginning of the shower it is great, but when it is time to rinse, using cold water closes the cuticle, which locks in the moisture from the conditioner. 3. Use products that treat a specific need. There are tons of wonderful hair care products on the market, and choosing can be very difficult, but I found it is always best to choose a product targeted for a specific problem. For example I am using the KerMax system, which is designed to stop hair loss. While I am not balding yet, and I clearly have a lot of hair, I experience a drastic amount of hair fall, and it is not only an annoyance, but it worries me that soon I may noticeably lose my hair. While being so concerned with looks does not make me beam with pride in my ability to focus on the important things in life, it is an unfortunate fact that thick, full hair is seen as beautiful and thin, flat hair is not. With 40-50% of women suffering from hair loss, I have to use KerMax in my beauty routine, even if only for my peace of mind. KerMax is all natural. It is drug-free and available over the counter. 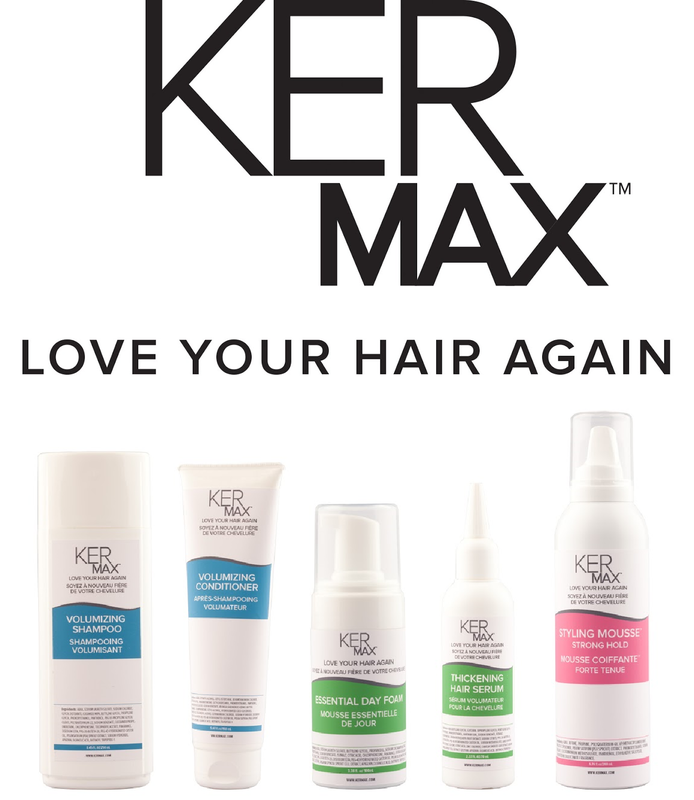 KerMax is available in Canada at all Shoppers Drug Mart locations, and in the United States at all CVS locations, and CVS online. 4. Keep hair up, gently. When I wear my hair down, it gets caught on everything. In the zipper on my jeans, necklaces, even rings or bracelets. It gets tangled around my kids and snacks on the knobs of my lower cupboards. There is almost nothing it won't get stuck on. Of course, when it gets stuck, it also tears and gets split ends, which is the quickest way to do irreparable damage. I keep my hair up basically all the time unless I am sleeping, washing it, or going somewhere special. I keep it in a bun or a sloppy "bun", but I have to do it gently and even stop and start over if I give it a wrong twist. I have felt and heard some out of place strands rip or try to rip right out, just by me trying to put it up. There is so much that some goes one way, and some goes the other, and when I try to pull through, it starts to break and I have to stop, and start again. It is sometimes quite a hassle, but it is much better than the damage it would otherwise cause. 5. Use a detangling brush. This may seem like a simple one, and perhaps even a no brainer to many of you, but a brush made specifically to be detangling works so much better. I will never go back to a traditional brush. I can handle any pain that brushing may cause, but the pain means damage, and I am not going to subject my hair to that. Detangling brushes have bristles of varying lengths, so they separate tangles without tearing, and they make hair looks smooth. Also, they don't add static like some brushes do. Obviously these tips are probably not life-changing, and they may not work for everyone, but I am always asked about my tips, and these are what works for me. I hope they will help someone achieve the hairstyle they want. I just might be able to help in another way as well. KerMax has been generous enough to sponsor a giveaway for one KerMax system (Shampoo, Conditioner, Day Foam and Hair Serum - a $150 value.) Enter below for your chance to win. Good luck! Looking forward to trying the KerMax products. I've been hating my hair since it started to thin over 5 years ago. I've had to turn to hats because I've been so embarrassed of my hair. I hope it helps! I've noticed "hair fall" too lately. KerMax sounds good-I like the all-natural aspect. My tip is: use a little white vinegar about once a month to clarify. Rinse with lots of cold water! The KerMax products are always the perfect choice for me. Thanks. how to get mats out of human hair Really appreciate you sharing this post.Really looking forward to read more. Awesome.